...and can be contracted by contact with a doorknob contaminated by a sneeze from an infected person an hour or more before, experts told The Post Tuesday. It's the droplets that may become airborne. Subtle difference. But then, the droplets carrying the virus can land on surfaces, and remain infectious for quite a while. Dr. Rossi Hassad, a professor of epidemiology at Mercy College, said droplets could remain active for up to a day. “A shorter duration for dry surfaces like a table or doorknob, and longer durations in a moist, damp environment,” Hassad said. In Monrovia they get their Ebola information from makeshift chalkboards. In the US, survivalists are all over the internet, advising readers how to live through the forthcoming apocalypse. First, let's be clear. Ebola is spread when someone comes into direct contact - through broken skin or mucous membranes - with infected blood or body fluids. It's also transmitted by contact with contaminated surfaces and objects, although the risk of transmission is low. But Ebola is not an airborne infection - although droplets from an infected person's cough or sneeze could in theory pass on the virus. The World Health Organisation says previous outbreaks revealed no instances of airborne infection. No virus that causes disease in humans has ever been known to mutate to change its mode of transmission. This means it is highly unlikely that Ebola has mutated to become airborne. It is, however, droplet-borne — and the distinction between the two is crucial. Doctors mean something different from the public when they talk about a disease being airborne. To them, it means that the disease-causing germs are so small they can live dry, floating in the air for extended periods, thus capable of traveling from person to person at a distance. When inhaled, airborne germs make their way deep into the lungs. Chickenpox, measles and tuberculosis are airborne diseases. Droplets of mucus and other secretions from the nose, mouth and respiratory tract transmit other diseases, including influenza and smallpox. When someone coughs, sneezes or, in the case of Ebola, vomits, he releases a spray of secretions into the air. This makes the infection droplet-borne. Some hospital procedures, like placing a breathing tube down a patient’s air passage to help him breathe, may do the same thing. Droplet-borne germs can travel in these secretions to infect someone a few feet away, often through the eyes, nose or mouth. This may not seem like an important difference, but it has a big impact on how easily a germ spreads. 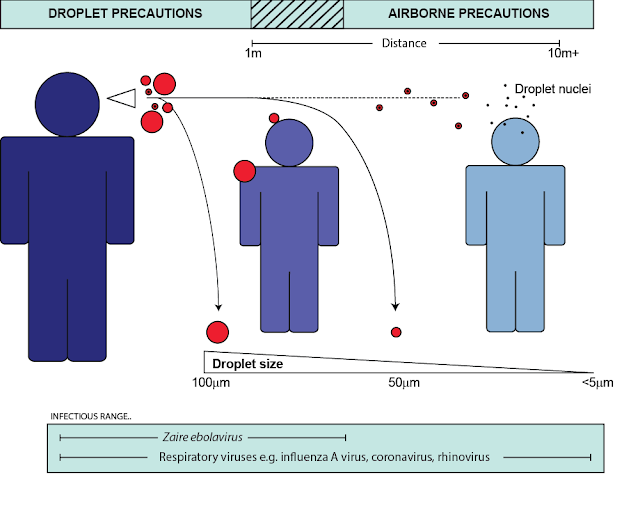 Airborne diseases are far more transmittable than droplet-borne ones. Richard Preston‘s remarkable book, "The Hot Zone," chronicled an Ebola Reston virus outbreak at a primate quarantine facility just outside Washington. The monkeys didn’t have direct contact with each other. CDC and military experts had to consider the possibility that Ebola Reston virus might be airborne. But feces thrown about the room, aerosols used in pressure washing the monkey cages or contaminated gloves used to handle the animals could also have transmitted the virus. It is important to emphasize that Ebola Reston virus does not cause disease in humans. It also survives longer than Ebola Zaire — the species responsible for the West African epidemic — when aerosolized in the lab. But even Ebola Zaire can remain infectious when aerosolized for at least 90 minutes. What happens in the lab, however, doesn’t always represent the real world. Since the Reston scare, scientists have learned more about Ebola transmission from other outbreaks. In 1995, more than 300 people became sick with Ebola in Kikwit, Democratic Republic of the Congo. Disease detectives were unable to determine how 12 of the patients were exposed — again raising questions about the possibility of airborne transmission. But if Ebola could be transmitted through the air, at least some family members of Ebola patients should have gotten sick even without direct contact. That didn’t happen. Ebola struck again in 2000, this time affecting more than 400 people in Gulu, Uganda. Not all had direct contact with another Ebola patient. Bedding and mattresses seemed to be one source of infection. So did sharing a meal with an Ebola patient — which often meant using fingers to eat from the same plate. Each had in common likely exposure to infected bodily fluids. That is a question Alex Smith attempts to answer in his latest book, Ebola: Understanding and Preparing for an Outbreak. In it, he discusses topics such as: symptoms, transmission, treatment, the history of the virus, the current outbreak, how to prepare, what to have on hand, measures to take if the worst is realized (quarantines, isolation rooms, cleaning procedures, etc.) and more. Until about three months ago, I would have accused someone of being a doomsday prepper dork if you were getting ready for quarantines, now I see things in a slightly different light. Quarantines are now a reality for a small group of Americans and Europeans who have come into contact with Ebola patients. Although I am not quite ready to get my isolation room ready, I am starting to rethink some of my preps (or lack there of). At 116 pages (paperback version), the book is short and concise. There is no filler to pad the length. Every page contains well researched information. Speculations by the author are backed up by studies that he references in the book. The CDC makes (made)no mention of transmission through airborne droplets in humans. (at the time of the printing of the book) Because of the severity of the current outbreak, however, transmission through airborne droplets seems like a possible explanation. Note that the author says airborne droplets and not simply airborne. There is a huge difference. Airborne implies that a disease can be spread through the inhalation of tiny, dry particles that remained suspended in the air for long a period of time. These particles could also theoretically be transferred through air currents. Ebola is not airborne in this sense. The rate of infection is much too low. If Ebola was truly airborne, it should spread at a rate similar to tuberculosis, chickenpox or measles. One person with measles, on average, infects 12 to 18 people. The current Ebola outbreak appears to spread, on average, to one to two people. This value is known as the Basic Reproductive Number, R(0). The following is a chart of the Basic Reproductive Numbers for various diseases. Airborne droplets, however, is a different story. Airborne droplets are relatively large (when compared to the dry particles that are suspended in the air by an airborne disease), wet particles, propelled through the air by way of coughing, sneezing or violent vomiting, that land on walls, floors, or other people. It is entirely possible that Ebola is spread via airborne droplets. The CDC still denies this. The WHO downplays the probability. Other experts, especially those who are independent of governmental organizations, are not as quick to dismiss this. Despite CDC claims that droplet transmission is not possible, it has been shown that VHFs have an infectious dose of 1 to 10 organisms by airborne droplets in non-human primates. If you buy a new print edition of this book (or purchased one in the past), you can buy the Kindle edition for only $1.99(Save 50%). Print edition purchase must be sold by Amazon. Learn more. Start reading Ebola: Understanding and Preparing for an Outbreak on your Kindle in under a minute.